Emboldened by last Friday’s comfortable seven-wicket defeat of Derbyshire, Yorkshire Vikings travel to Trent Bridge to take on Nottinghamshire Outlaws keen to continue their good start to their 2015 NatWest t20 Blast campaign. For 25-year-old Jonny Bairstow, a cricketer whose professional development has taken place in parallel to the growth of the short-form game, the Vikings’ second match offers a useful opportunity to maintain their form against a side which also prides itself on its t20 capabilities. “It was a good start last week,” said Bairstow. “But there’s still areas we can improve on if we want to go to the latter stages of the competition and it’s key that we learn from every game. “They are just the little one percenters that we know as a group we work hard on and pride ourselves on. They are the kind of things that if you want to be ruthless in this competition, you’ve got to do consistently well. “And when you come up against a side that has you on the back foot, they are the one percenters that will pull you through a game you shouldn’t necessarily win. “I thought we chased down 128 relatively well against Derbyshire,” continued Bairstow. “There were nearly four overs left with seven wickets in the hut when we won. However, the game at Trent Bridge and the Outlaws’ dark green livery may also stir slightly painful memories for Bairstow and the rest of the Yorkshire team. Defeat to James Taylor’s men at Headingley last year ended Yorkshire involvement in the 2014 Blast at the conclusion of a match in which Aaron Finch’s thunderous batting had seemed to put them in the five bob seats. It all ensures that Andrew Gale’s team won’t be taking their opponents lightly under the Nottingham lights. 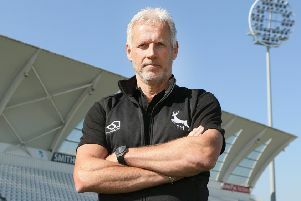 “Nottinghamshire are a tough side in every form of cricket,” said Bairstow. “We know the challenges we’re going to face when we go there, but it was a good performance against Derbyshire, and we can take a lot from it. “Having scored a century in the first innings, I was very disappointed to get out for 59 in the second innings of the Championship match against Hampshire. I felt like I should have carried on there.